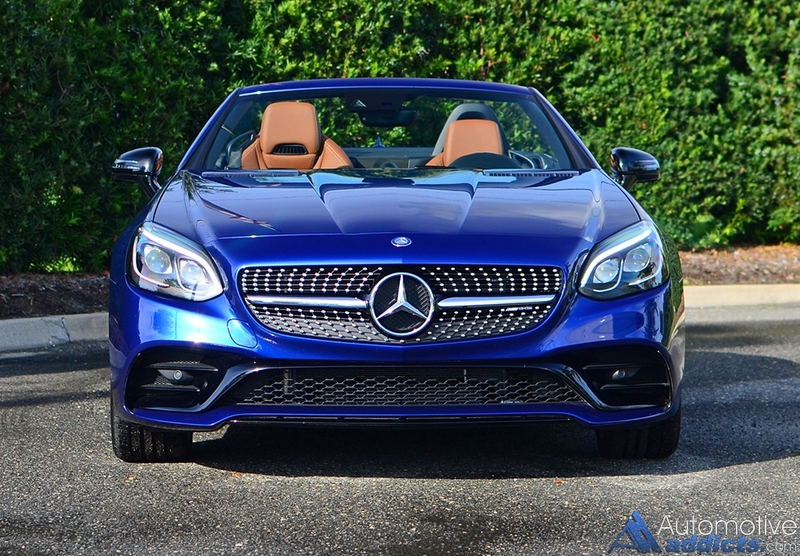 Mercedes’ newly defined Mercedes-AMG signification is eager to provide a wide array of performance oriented vehicles that give consumers a satisfying thrill for those who seek something above and beyond what non-AMG-badged vehicles have to offer. In the full spectrum of performance from the German brand, Mercedes-AMG attempts to garner each of its Classes with the proper AMG chops and a new simplified nomenclature to boot. New for the 2017 model year is the Mercedes-AMG SLC 43, a vehicle that supersedes the two-seater luxury pocket rocket roadster known as the SLK55. The new SLC 43 carries a tradition of a compact package that sports a serious attitude on the road but this time, replaces the SLK55’s V8 and makes due with the brand’s 3.0-liter twin-turbo (BiTurbo) V6 engine packing 362 horsepower at 6,000 rpm and 384 lb-ft of torque at 2,000 rpm. 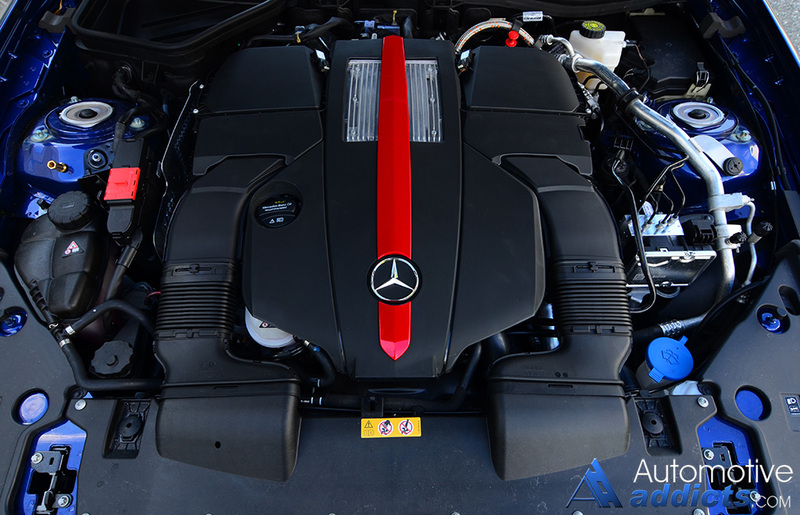 The engine gets mated to a new 9-speed automatic that Mercedes-AMG calls the 9G-Tronic Transmission, which I felt was the perfect match to extract all of the BiTurbo engine’s might to keep on pace where the SLK55’s naturally aspirated 416-horsepower V8 left off. 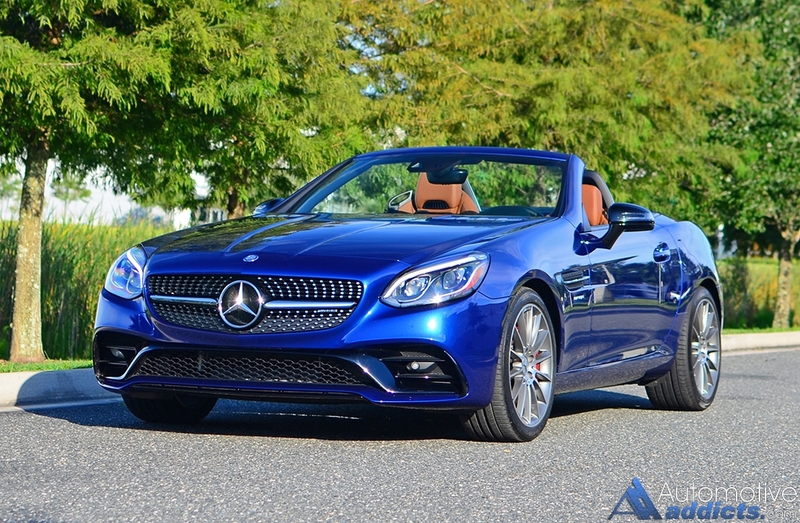 While the new 2017 Mercedes-AMG SLC 43 is down on power compared to its predecessor, that doesn’t keep it from living up to true performance expectations as it can run to 60 mph in about the same time as the SLK55, about 4.6 seconds. 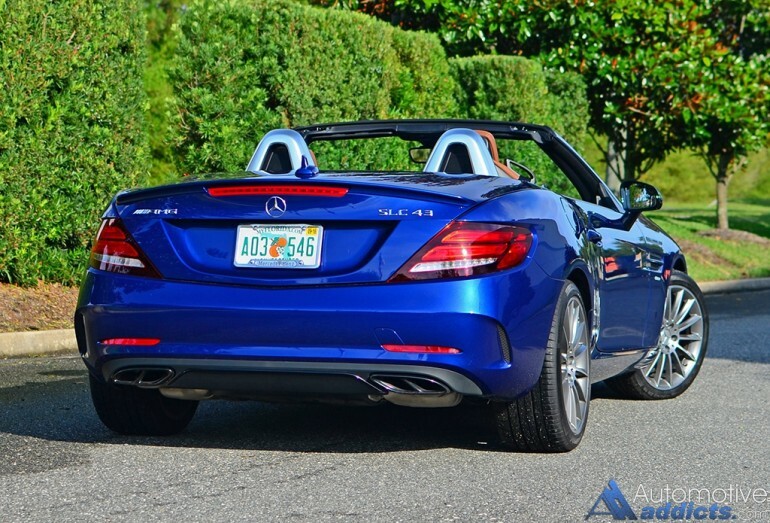 In addition, the new SLC 43 keeps the tradition of AMG being at the upper echelon of each Class’ trim level. With that, the SLC 43 gets lightweight construction and more efficient ways of putting down its force-fed power to the rear wheels. 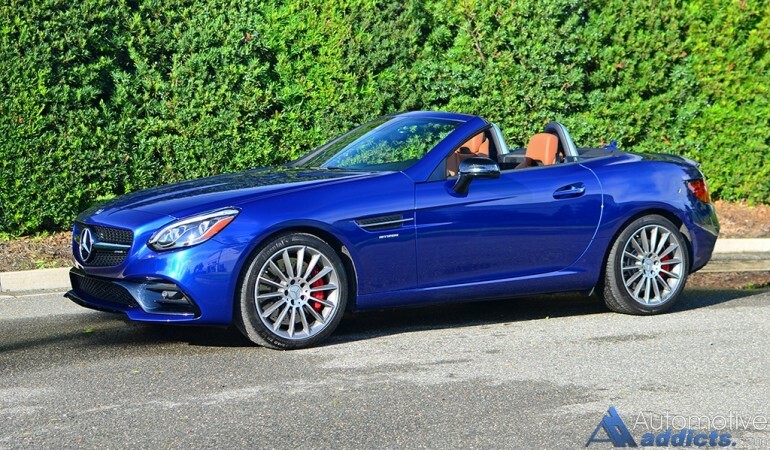 Through the use of lightweight aluminum brake calipers, light 18-inch alloy wheels, and forged aluminum bits for the suspension, the SLC 43 is able to keep its curb weight down to 3,518 pounds, which remains to be less than the outgoing SLK55. The culmination of its added efficiency and stability on the road allow the SLC 43 to better use its power and athleticism that doesn’t disappoint. The SLC 43 proves to have multiple personalities through its five Dynamic Select modes, Eco, Comfort, Sport, Sport+, and Individual. The default Comfort mode keeps the exhaust note tamed with an expected shift pattern than hardly ever stumbles or hunts for gears in the large sea of nine forward cogs. Sport mode livens up the shift pattern a bit where Sport+ adds noticeable weight to the steering effort and responds with a thrashing clatter from the exhaust upon deceleration and closing of the turbos wastegate. It’s all satisfying to your senses especially with the top down to hear an unfiltered version of the SLC 43’s backfiring soundtrack. The efficiency of the new engine combined with a 9-speed automatic transmission yielded respectable mpg fuel estimates where I averaged about 28.9 mpg overall. While the final EPA mpg figures have not been released yet, I expect the new Mercedes-AMG SLC 43 will get about 21 mpg city and around 35 mpg highway, potentially making it one of the most fuel efficient AMG vehicles around. I found that the performance of the SLC 43 to be quite adapted for those who like to carve canyon roads with the versatility of a Vario-Roof power hardtop. The unique roof gives you a choice of a closed hard top that has a panoramic glass element with Magic Sky control to select one of two brightness levels to let the sunlight in, or open up the top all together in under 20 seconds. With the top up, there is a nice sense of the SLC 43 being an uncompromised 2-seater coupe keeping the elements out and enough sound separation to complete its luxurious cabin’s theme. 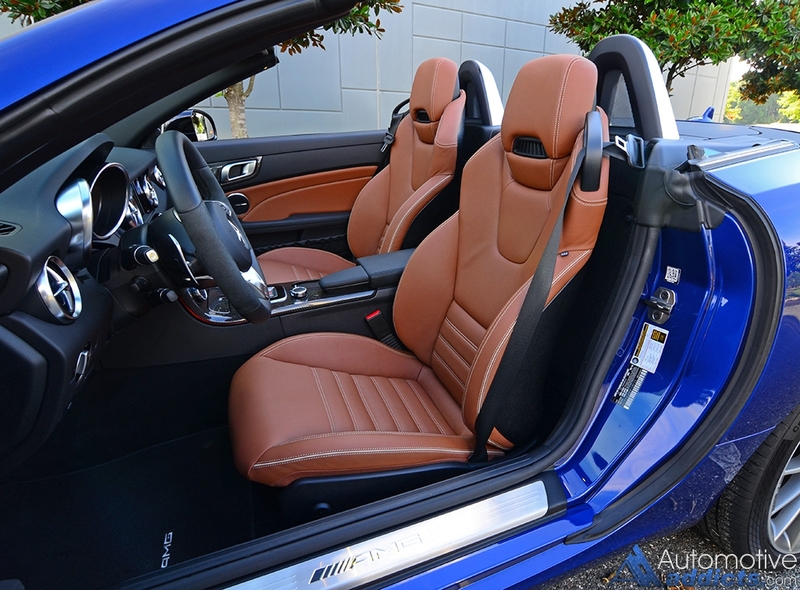 Putting the top down the SLC 43 transforms into a hot-prodded roadster alive with AMG performance under most climate conditions thanks to the AIRSCARF system that provides neck-level heating for both seats. The overall ride quality of the SLC 43 was somewhat disappointing where it failed to adapt to rough road surfaces or bumpy roads. The rear dampers allowed the back to flail a bit and had somewhat of an unwanted extra rebound going over waving road areas. Fortunately, the front end by way of its sharp speed-sensitive sport electric steering rack went precisely where you pointed it through small increments of steering inputs. The steering, due to its quick ratio, takes a while to adapt but makes you feel like a junior version of Lewis Hamilton doing a couple runs through Monaco, a bit slower maybe. The new exterior proportions of the SLC 43 find a welcomed place within the Mercedes-AMG lineup as it boasts more muscular angles than the outgoing SLK55. The fenders bulge and the initial impressions are of a much larger vehicle with a dominating presence on the road. Some of those exterior highlights, from its diamond sculpted grill and impressively bright Dynamic LED headlights with brand signature eyebrow daytime running lights, all translate well into the substance that the SLC 43 offers in its cabin. 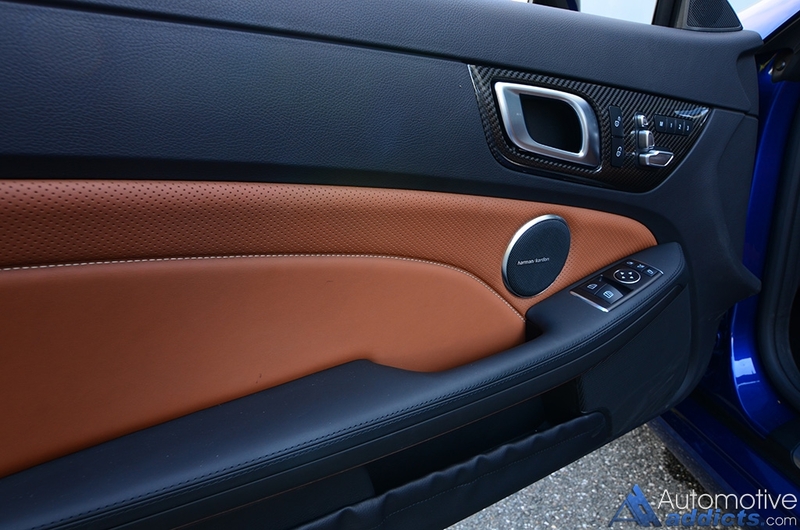 Mercedes-Benz has a way with being unmistakable in their interior designs and much of what is found in late model Benz vehicles has been brushed up to fit the AMG mold in the SLC 43. The seats, while can be on the smallish side, are surprisingly comfortable and form fitting for most. There is enough room for those who are slightly over 6 feet tall but not much more. 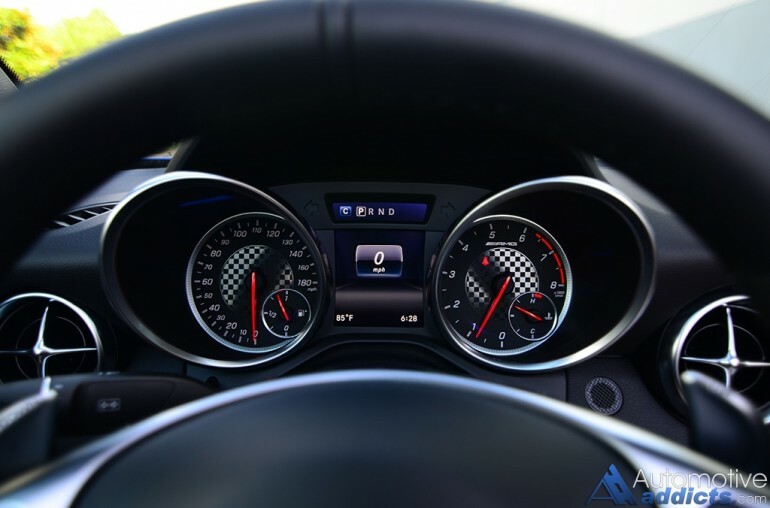 Much of the dashboard layout is customary to modern-day Benz with an AMG flare by the way of carbon fiber and aluminum trim and several soft-touch surfaces throughout. Still, there is no getting around the fact that the SLC 43 is a small roadster that gets even smaller with the top down when it comes to cargo capacity. 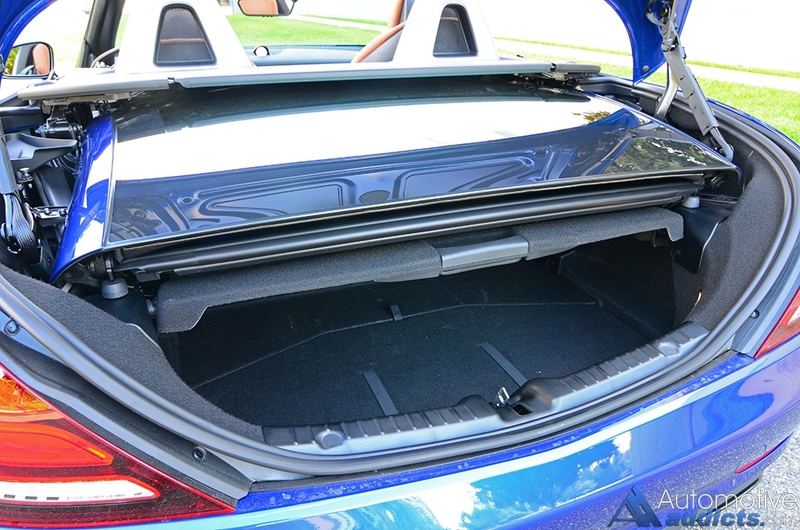 Surprisingly, there is just over 10 cubic feet of space in the trunk if you never let the top down. However, if you desire to place the top down, expect your cargo capacity to be cut to just over 6 cubic feet of space, hardly enough room for several-day getaway trips. The many creature comforts expected from the brandishers of automotive luxury can be had in the new SLC 43. Mercedes-AMG didn’t leave many stones unturned in the luxury department and plethora of active safety features, both standard and optional. 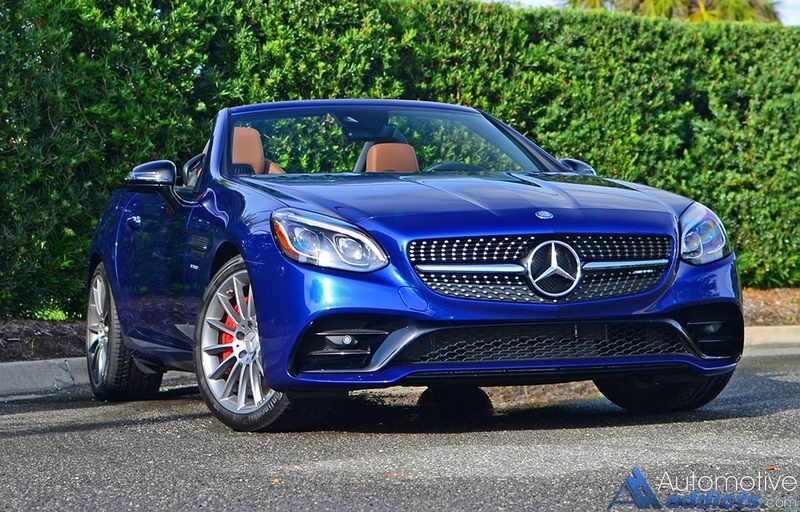 My nicely-equipped SLC 43 Roadster featured several options in the form of the Magic Sky Control roof, 18-inch AMG wheels, AMG Night Package (gloss black front splitter, diffuser trim, front apron fins, and black chrome tailpipes), AMG Handling Package (limited-slip differential, red brake calipers, AMG performance flat-bottom steering wheel, and IWC analog clock), and the Premium 2 Package (COMAND w/GPS navigation, voice control, mbrace telematics, active LED headlights w/auto highbeam, dual-zone climate, smartphone integration w/ Apple CarPlay and Android Auto, ambient lighting, and infrared remote roof automation). The totality of the smallish SLC 43 packs in a lot in the confines of a bite-sized package. Such is justifiable to a base price of $60,300 but can be a bit hard to swallow at the $75,375 of my test vehicle, which still has room to grow with additional optional features. EPA passenger volume: 48.8 cu.ft.